Humanity’s demand for energy is growing at an astonishing rate. Combine this with an ever-dwindling supply of fossil fuels, and it becomes painfully clear that something innovative and powerful is required. There’s one high-tech proposal that holds tremendous promise — an idea that has been around since the late 1960s. Here’s how space-based solar power will eventually solve all our energy needs. Assuming that economic progress and globalization continues at its current pace, we’ll need to produce twice the amount of energy that’s consumed today by the 2030s — what will reach a monumental 220 trillion kiloWatt hours per year. And by the end of the century, we’ll need four times the current rate of consumption. Just as importantly, we’re also going to have to kick the fossil fuel habit — and not only because it’ll eventually run out. Rising CO2 emissions are wreaking havoc on the Earth’s atmosphere, what’s creating environmentally deleterious side-effects at a rate faster than expected. Moreover, if greenhouse gases are to be brought under control over the course of the next several decades, we’ll need to get upwards of 90% of all our energy from either renewable or nuclear sources. 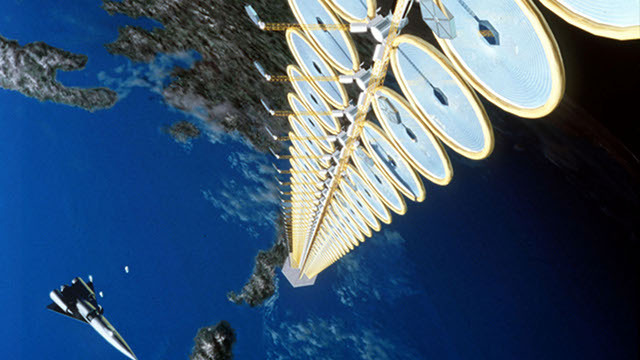 Read more: How space-based solar power will solve all our energy needs — io9.